When heiress Alice Peavley runs into her old friend Maia, the last thing she expects is the string of chaotic events that follows. There’s the loud and cranky chicken to contend with. And Reg, the playful but well-meaning pooka. Not to mention the impending moa race, and the characters it’s attracting. Can Alice, with the help of her trusty gnome valet Macalley, keep her wits and come out on top? 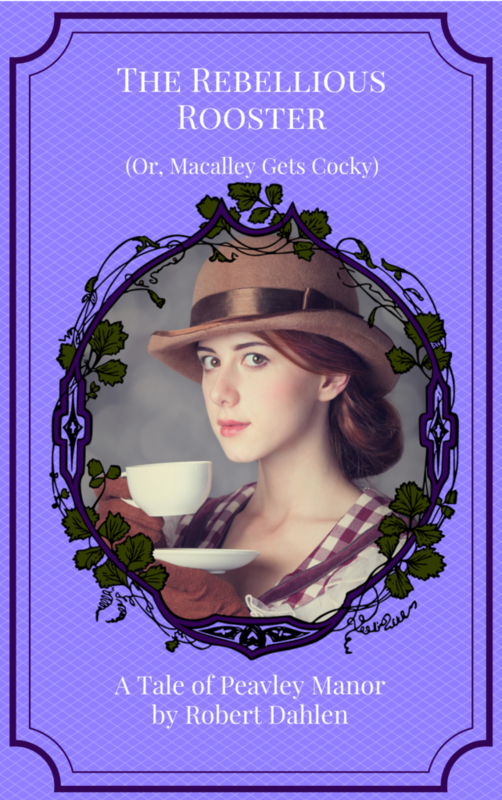 Grab a scone, some snarkleberry jam, and a cup of tea, and find out! The Missing Mallard (Or, “Duck, Macalley! Duck!”) – out now! The time is here to unravel the mystery, as the feathers fly and the villains gather! “The Missing Mallard (Or, ‘Duck, Macalley! 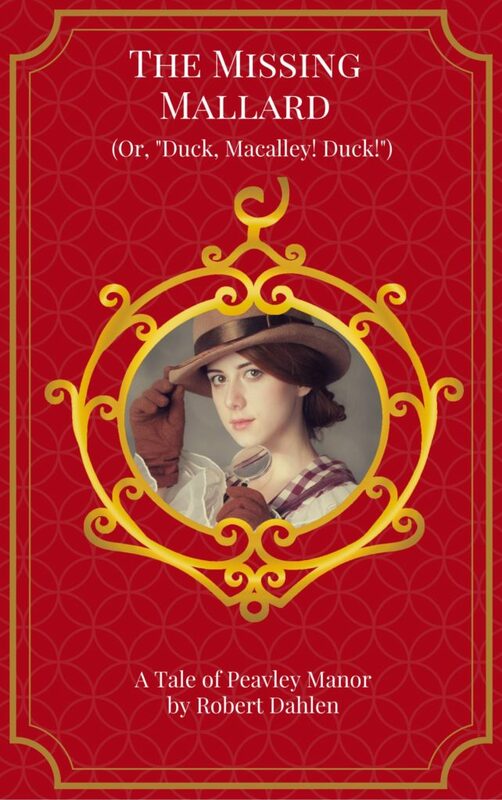 Duck!’)”, the new Peavley Manor novelette, is now available at Amazon and other e-book stores! Just 99 cents US/CA/AU! Check for links below the cut, or search your favorite store for “Missing Mallard”! One would think that an auction of duck paraphernalia would not create that much excitement. Unfortunately for Alice Peavley and her valet Macalley, one of the items in the auction, a golden duck figurine, is attracting far too much attention…especially from a number of villains and scoundrels. Food fights, pixie sorceresses, mad scientists, adorable yet destructive automatons – can Alice and Macalley prevail, or has doom come to Darbyfield? Sunday catchup, and we’re taking a break from the themed post titles. Why? 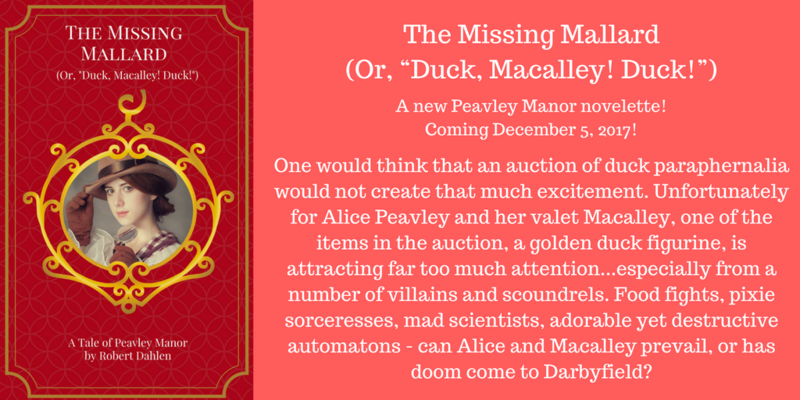 Well, hold on to your Santa hats – “The Missing Mallard (Or ‘Duck, Macalley! Duck!’)” will be coming out this Tuesday, December 5! “‘Villain’ is such a harsh term,” Gylburnt said. “Honored guests!” The quarrelers fell silent as Bludergard rose to his feet, clanging a spoon against his wine glass much as a best man at a rather trying wedding reception would, and punctuating his remark with a loud hiccup. “Alice!” I could hear the reproach in Clarinda’s voice. “Let him have his say. Even a stopped clock is right twice a day, you know.” I nodded and held my tongue as Bludergard resumed his speech. “Look at us!” he said, swaying slightly. “Quarreling over such trivial things. Which breed is best. We all love these marvelous creatures, and no breed should be placed above another.” I could hear murmurs of “Hear! Hear!” from the crowd. “Is this how we honor the memory of Trenton Fotheringay, the greatest of us all?” Bludergard continued. “We should respect each other’s opinions. We should focus on what brings us together.” I could see people nodding in agreement or dabbing at their eyes. Next to him, Stibbins nodded and lifted his wine glass. “Well spoken, guv’nor!” he said. The Thorn Harbour Road Rally – out today! Start your engines! 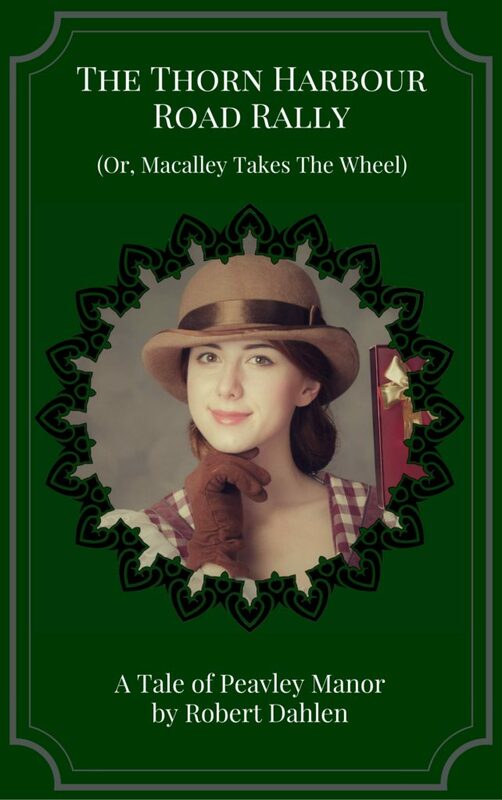 Today is the day that “The Thorn Harbour Road Rally (Or, Macalley Takes The Wheel)”, the new Peavley Manor novelette, makes its official debut! Well…technically, that happened Sunday if you were subscribed to my mailing list. That’s when the newsletter went out with links to let you download “The Thorn Harbour Road Rally” in .mobi or PDF. If you’re a subscriber and didn’t see the newsletter on Sunday, check your spam or junk email folders. If you’re not a subscriber, it’s not too late! Click here to sign up, and in your final confirmation email, you’ll get a link to download the ebook! And if you don’t want to subscribe…or if you want to help support what I do…or if you want to give an ebook to a friend…“The Thorn Harbour Road Rally” is available on Amazon! Click here to buy your copy, or search your local Amazon store. It’s just 99 cents US! Whichever way you choose to go, I hope you enjoy it. Thanks, as always, for your support!